The historic Reeves building located in downtown Columbus, Indiana began as a place where the Reeves family invented and manufactured steam engines, automobile models, wooden pulleys, sawmills, and thrashing machines among other products. Built in 1888, the Reeves family employed up to 900 workers in Southern Indiana at the height of business. Over the years, the building has served many purposes, but its most recent tenants and owners are a Columbus based law firm, Cline King and King, which occupy the front office space. The 200,000+ square feet warehouse space is rented to Dorel Group for the storage of products. 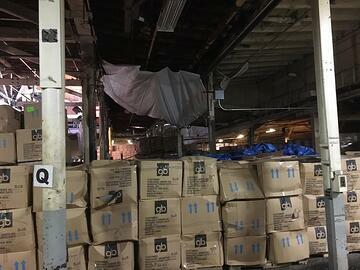 When the flat roof leaks began to take up valuable warehouse space rendering it unusable, even damaging stored products during heavy rain, the building owners knew the roof had to be repaired. That’s when they called Exterior Pro Roofing. The existing flat roof was an asphalt based hot tar style that had been covered with spray foam roofing some years ago. 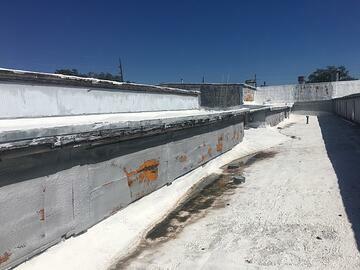 Not only were there multiple leaks in the roof, the spray foam roofing had become saturated with moisture. The roof needed to be torn off and replaced. 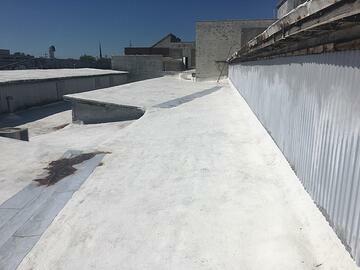 It had been such a long time since the buildings flat roof had been repaired that the owner wanted a clean start. This would include not only new plywood decking but also new roof insulation and a white PVC roofing membrane. 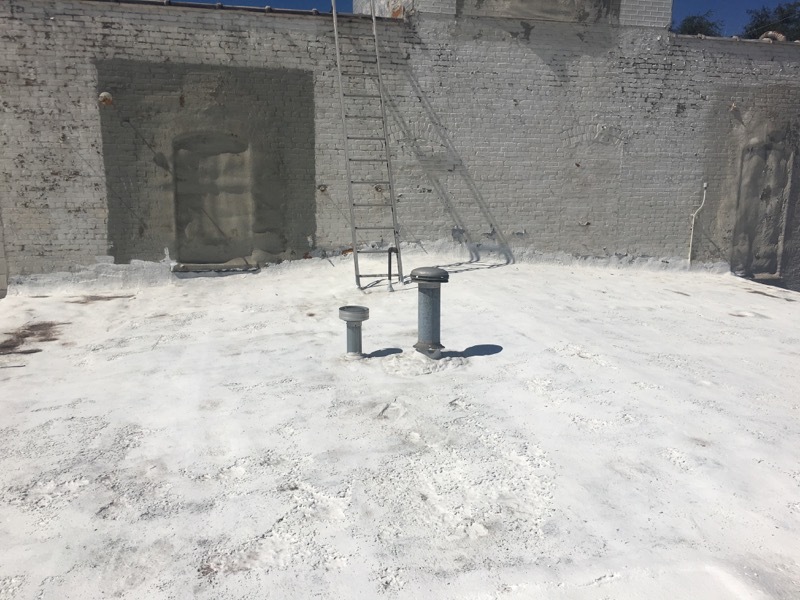 In addition to the extensive roof project, the owner wanted to install all new roof drains and even add drains to areas that were prone to holding water. The job took just over two weeks with a large crew of hard working guys from Exterior Pro Roofing. 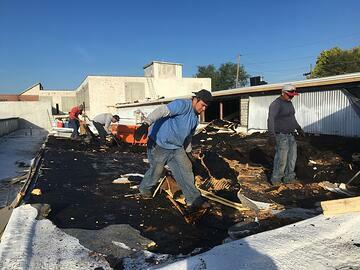 Each day, the crew would remove a section of old roofing and replace the wood decking, install two layers of new insulation, and install the new white PVC membrane each night before they quit for the day. The shift was normally 11-12 hour work days. At the end of every shift, a little more roofing was repaired until the entire area to be done during this phase of work was completed. No Roof Leaks for the first time in a long time!! The new PVC roofing membrane is sending water down the new drains and keeping the building dry. 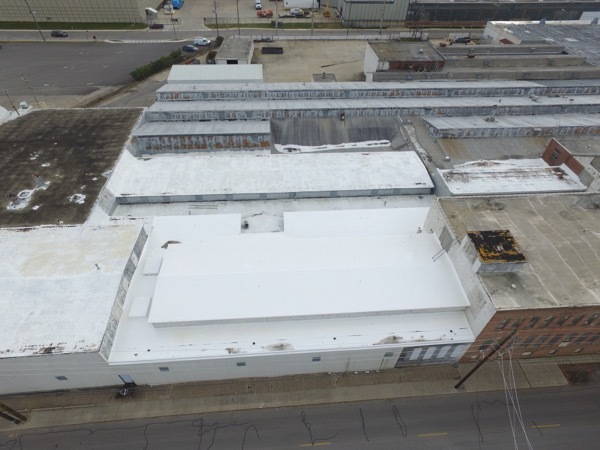 As an added benefit, the white roofing membrane and new roof insulation will keep the warehouse cooler during the summer months to make for a more comfortable work environment for those employed by Dorel Group. 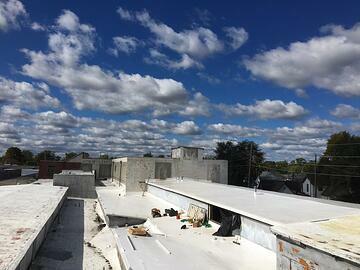 The flat roof repair job at the Reeves building in Columbus, Indiana went smooth and without any major hang ups. The next sections of roofing to be repaired are already in the planning and budgeting stages. Exterior Pro is happy to have built a strong working relationship with the Reeves building and its owners. Still not sure which repair option is a fit for you leaking flat roof? 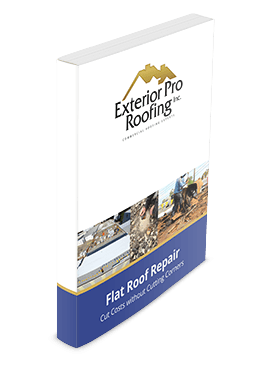 Get the guide and learn how to cut cost without cutting corners.